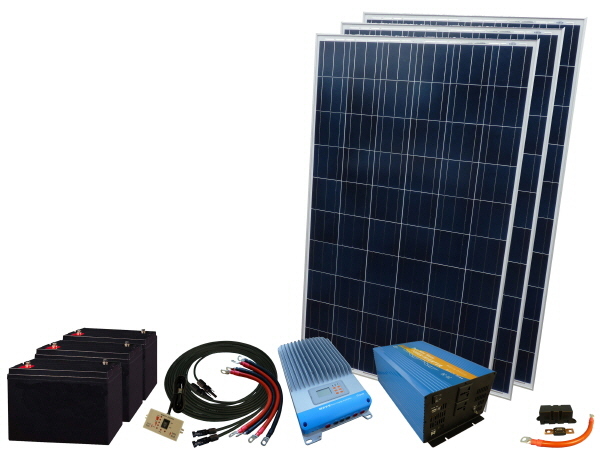 Our stand alone 825W off-grid solar power kit would typically be used where higher power generation is needed. Applications for our 12V off-grid solar systems include, remote location homes in the UK and abroad, home office, summer houses, workshops, static caravans, stables and outbuildings. Each kit has been designed for a quick and easy install and include all cables and connectors along with a 3000W Sunshine Power Inverter to provide a pure sine wave AC 230V supply from the DC batteries supplied. Solar mounting rail and fixing kit For pitched tiled roofs. Profile: One row x three solar panels in portrait. Sunshine Plastic Mounts for flat roofs, designed to be bonded down. Typical usage: static caravans, large RV's, liveaboard boats. Profile: Individual plastic mounts for each panel. Using the power of the sun and a state of art MPPT controller that intelligently regulates the working voltage of the solar panel this system can deliver approximately 275Ah on a 12V system per day during the summer months.